Well that was a mammoth task and a half ... found 2 more memory cards and didn't think there was much on them. Oh boy was I wrong. So have spent many an hour sorting through photos and putting them together either by date, occasion (party, holidays and general get-togetherness) and my crafting ones too. If nothing else it was a great workout for the "old grey cells" trying to place each one. It was also wonderful too as we looked through them as a family and had a great reminiscing session. The only downside ... I have confirmed to myself that I do so dislike myself in photos! I've seen several of these card designs and thought I'd give it a go myself. Loved it. What a great way to make everything look 3D and still the card folds down flat ... bonus or what? Sorry don't know the name of the fold but if any of you do, please do let me know. I covered the back panels with papers from "Rose Garden" by First Edition, inking all the edges. Next using the Mr & Mrs strip die, I created a panel and placed this on the largest of the back panels. I paper pieced Marmalade using papers from the same pack and inked all the edges. I have layered Marmalade up to give further dimension. Have to say I do adore a bit of paper piecing as it's a great way to use up all those paper bits that are just too big to throw away ... ! On the "Z fold" part, I have added half a King Cross suitcase and to hide the hollow inside, I have created a postcard. The diamond shapes are the waste from making the suitcase. On the smaller back panels, I have cut away the "Mr and Mrs" sentiment and stuck it on top of the designer papers, (which you can just about see if you get up really close to your screen ... lol). As a finishing touch I have added some hearts and flower bunches, using the accessory stamps and dies, ageing them with distress inks. Now after finding all those photos, begins the mammoth task of blogging them, so best get on. 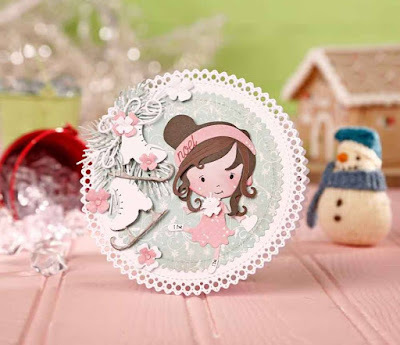 Happy New Year Lou, gorgeous card, love the design and cute bear. Wow, you certainly did add a ton of gorgeous details to this card. My favorite is the little bear. Thanks for joining us for our Out With the Old, In With the New challenge at Cut it Up, and Happy New Year! Enjoy using your new supplies. This is so fabulous, Lou! So many gorgeous details! Thanks for joining in at CRAFT Challenge!